Juncos. Early. I imagine the polar vortex sent them looking for easier climes. They’re a little hard to see. Look closely, they’re there! 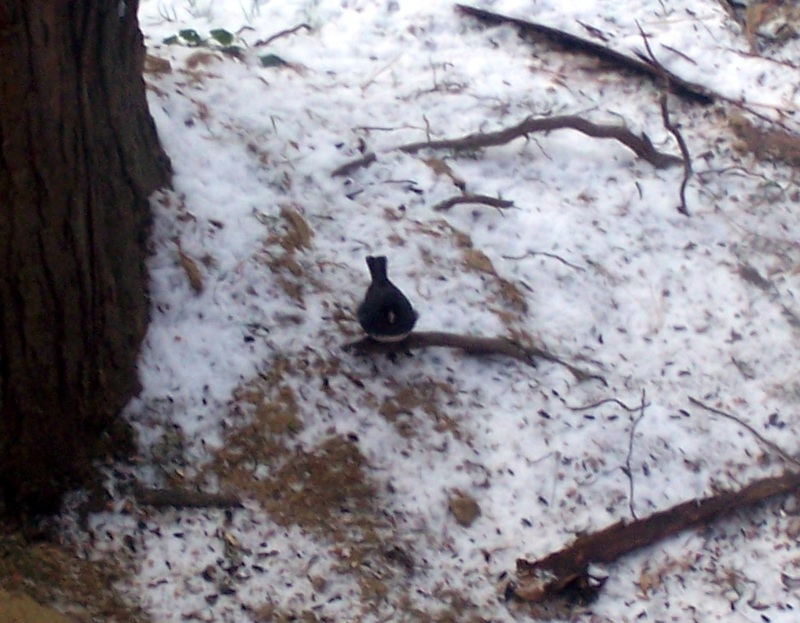 This charming little bird arrives each year to keep us company through the winter. 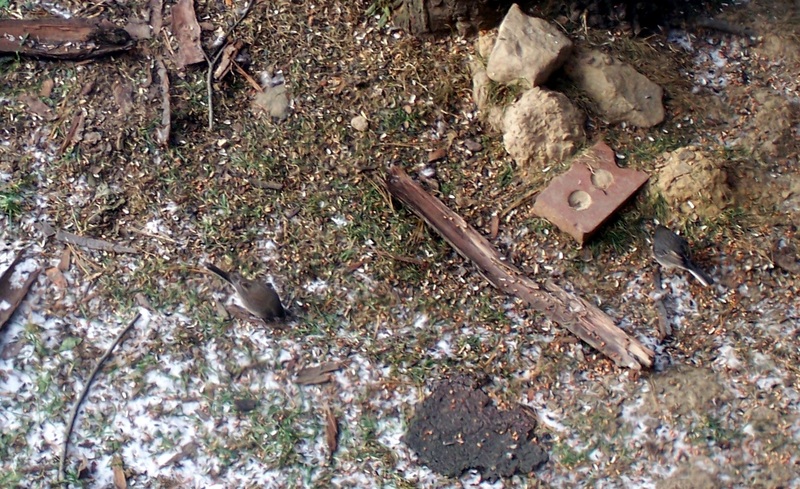 Known in some places as the “Snowbird”, the Dark-eyed Juncos arrive here each fall, usually November, and remain until spring. They then fly north or east into the mountains to mate and raise their young. 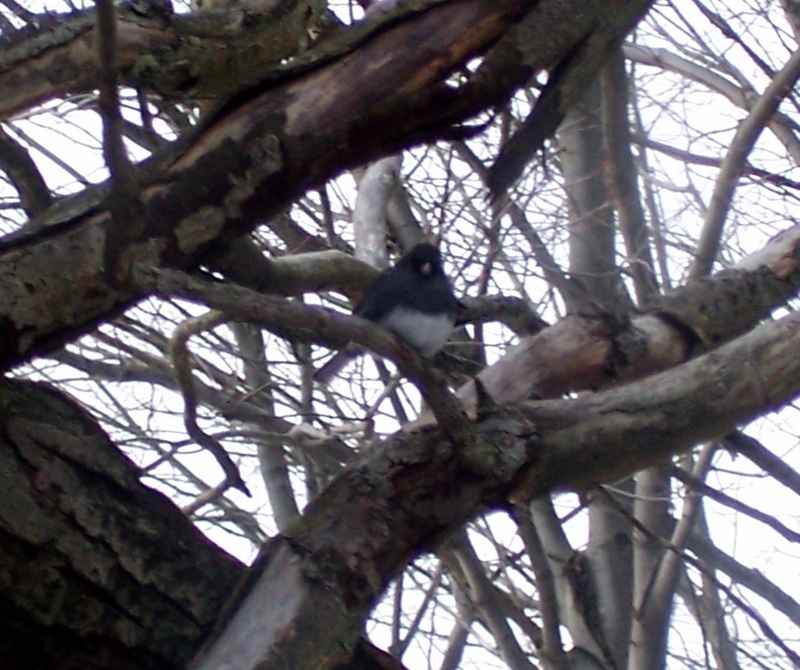 This is a picture of a male up in a tree from last year. 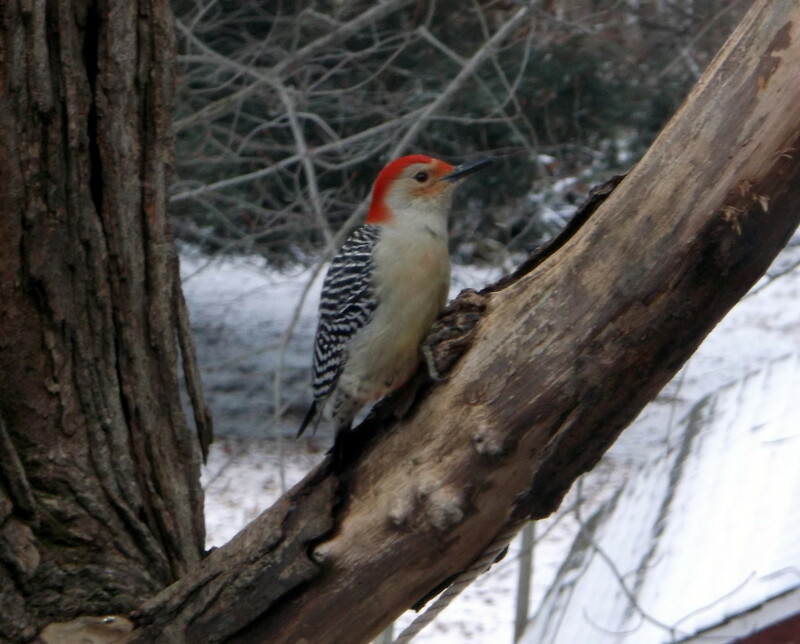 They normally prefer the ground and shrubs, but will come up into the trees to the feeders. 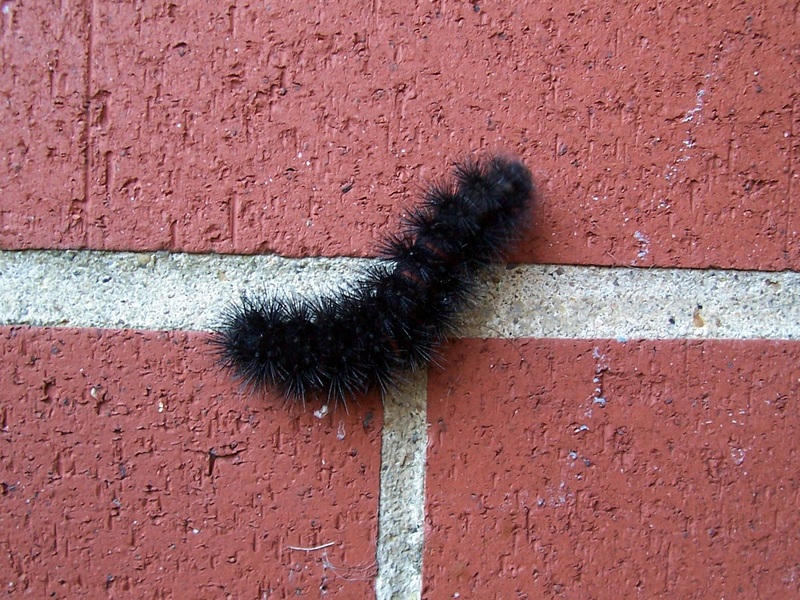 Folklore has it that the more black on the wooly bear caterpillar, the worse the winter! 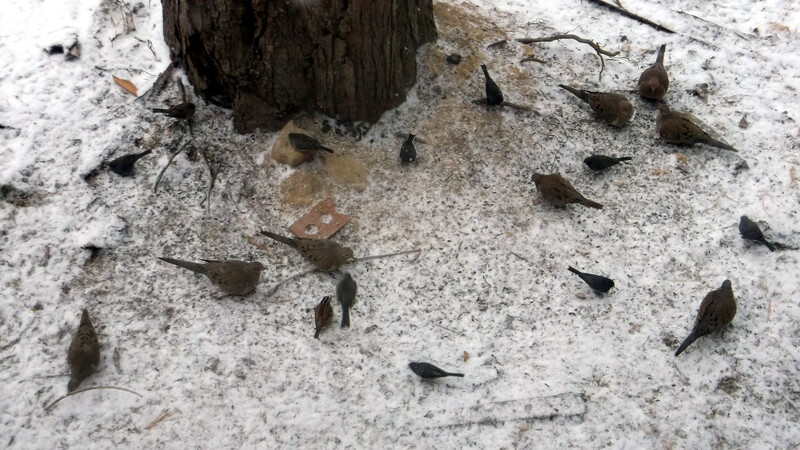 The Juncos and Mourning Doves sharing spilled grain. 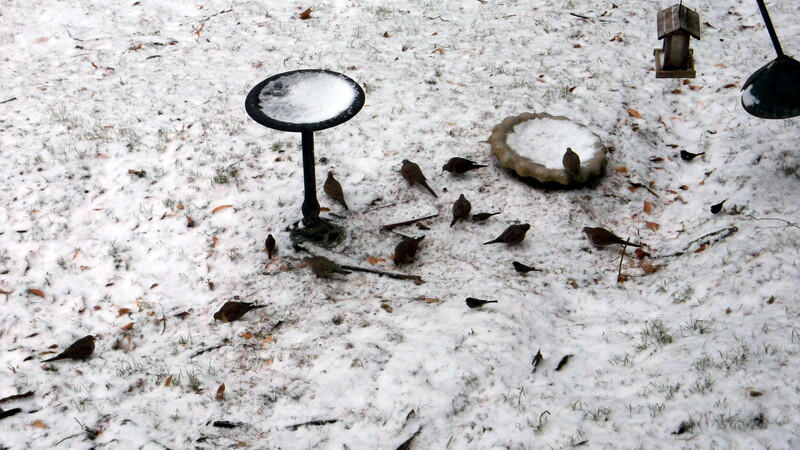 They prefer to eat on the ground rather than at the feeders. 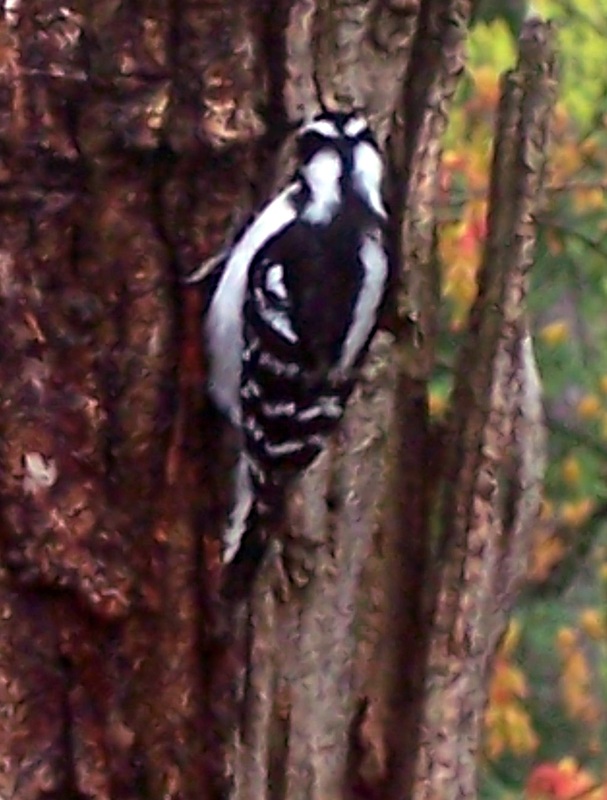 An early fall picture of a female Downy Woodpecker. One of our year round residents. The males actually do most of the brooding on the nest. 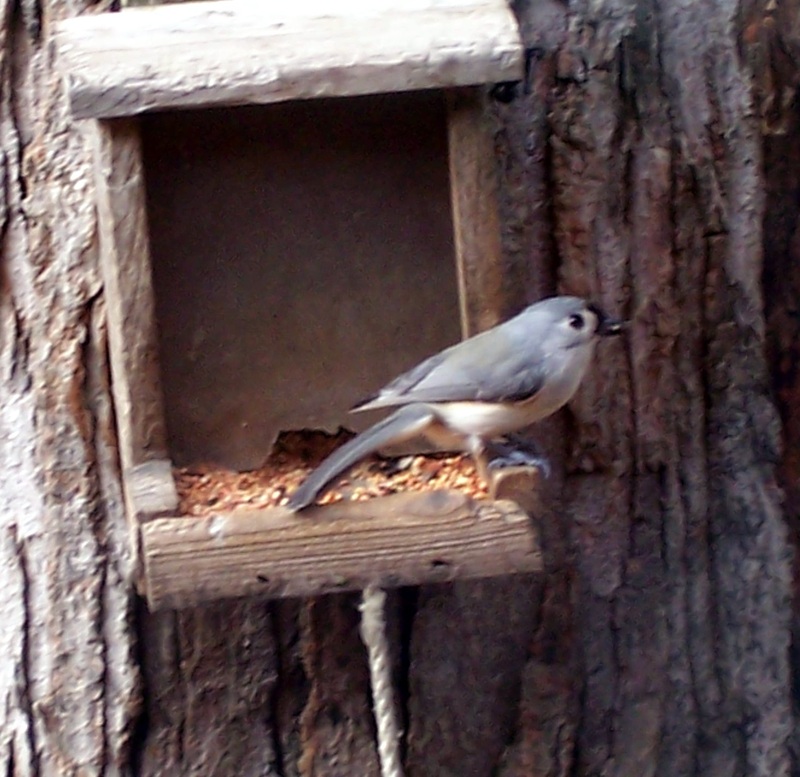 The Tufted Titmouse is a bold little bird that has been known to pull hair from sleeping dogs, cats, and squirrels to line their nests with. 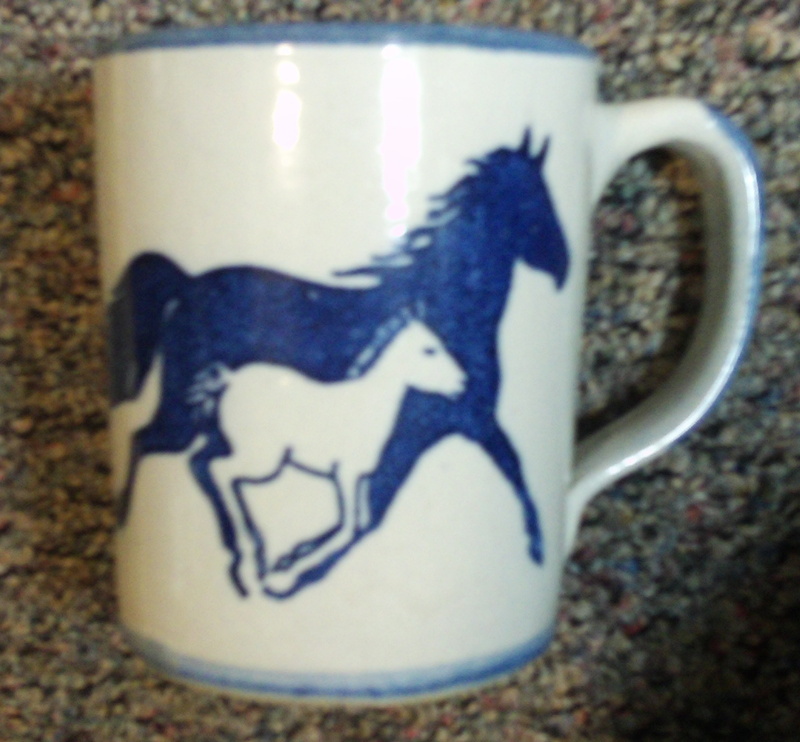 I have not always been thrilled with Blue Jays. 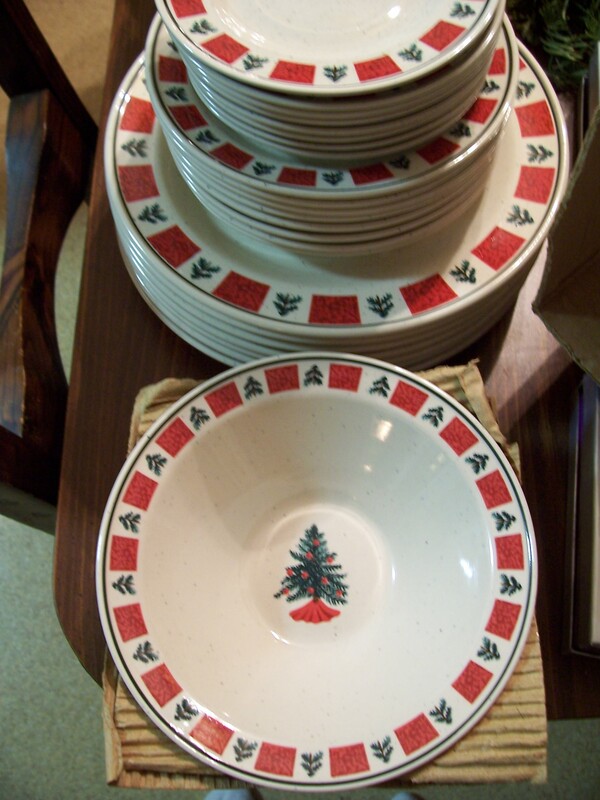 I’ve seen them tear apart other birds’ nests. But they are very engaging and lovely birds. 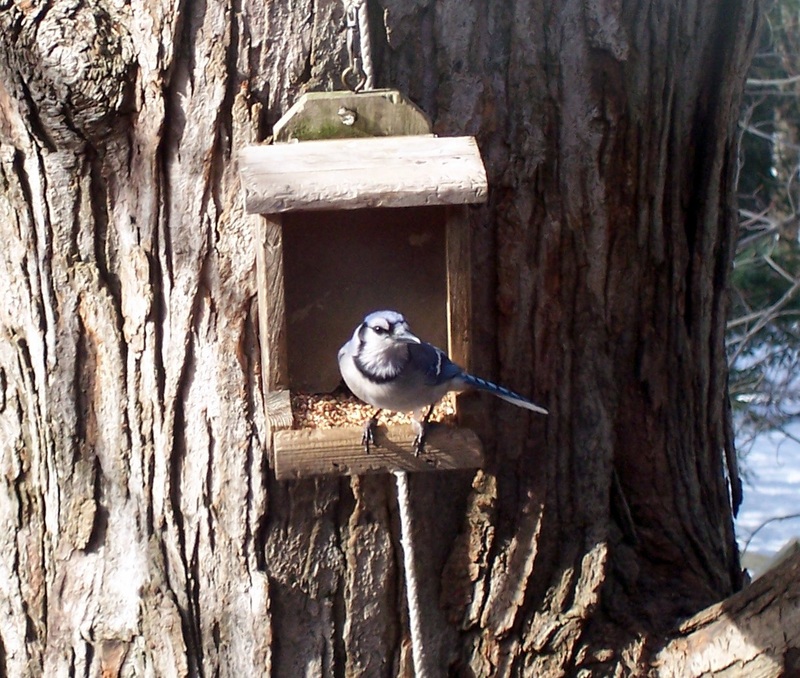 I had one Blue Jay that had learned to imitate a dog’s growl. And when I would sit outside on the bank near the feeders, he would come down to a low branch on the tree and growl at me! 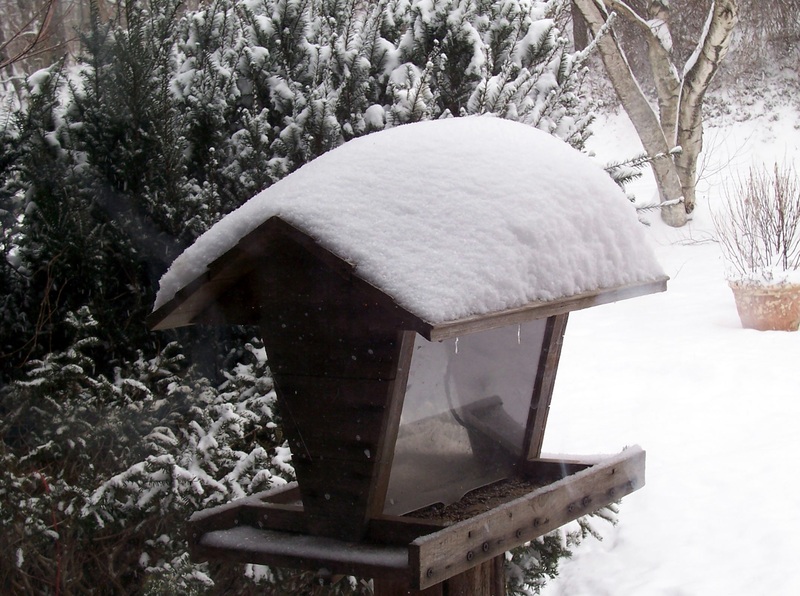 Someone, probably a deer, had knocked the bird seed out of the feeder to the right. So everyone was taking advantage of the extra. 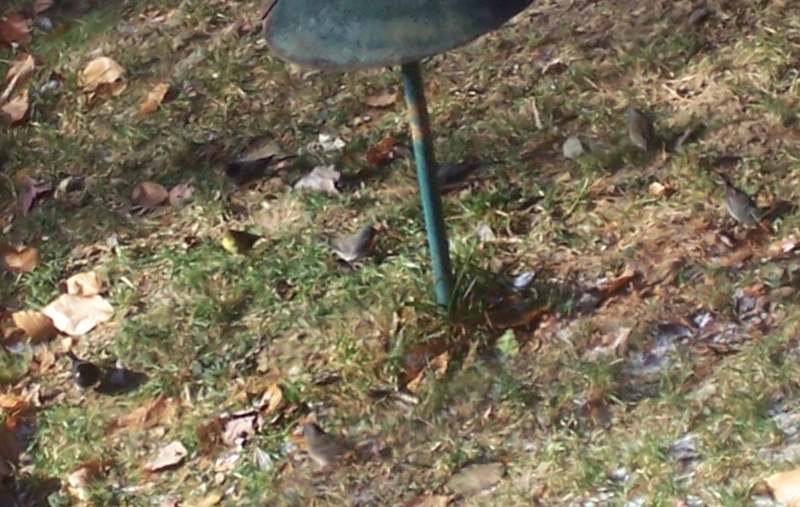 It was so cold at this time that even hot water poured into the birdbaths froze right up in less than an hour. 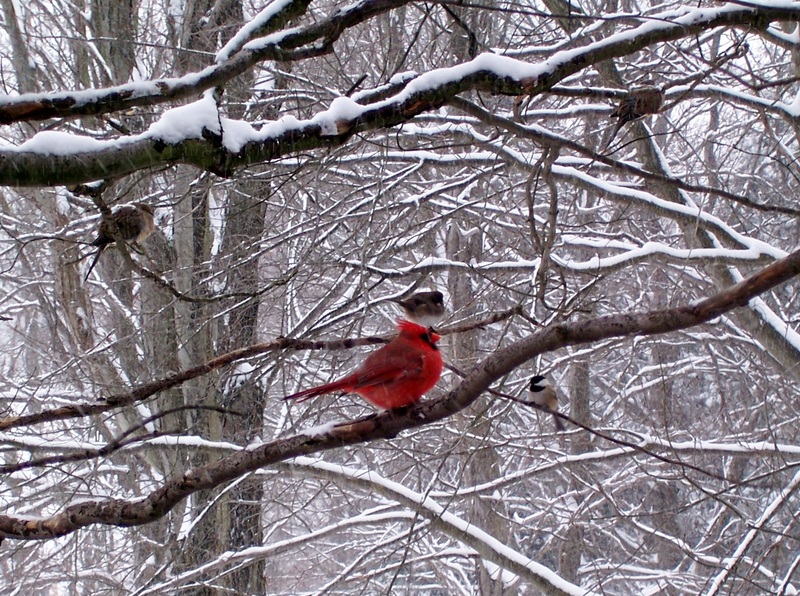 The Northern Cardinal. We usually have at least 5 mated pairs using our yard. These are the birds that tell me, with a special type of chirp, that night is falling. 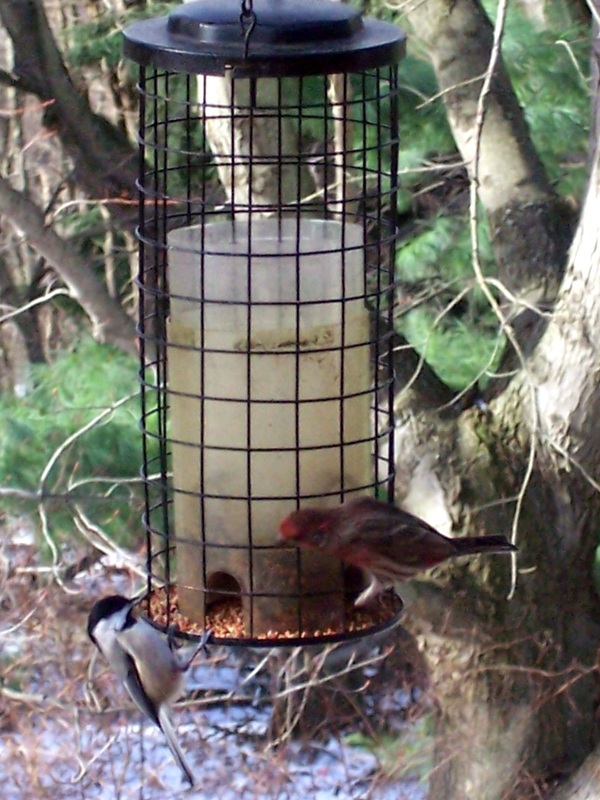 A Black-capped Chickadee and a House Wren squabble over lunch. 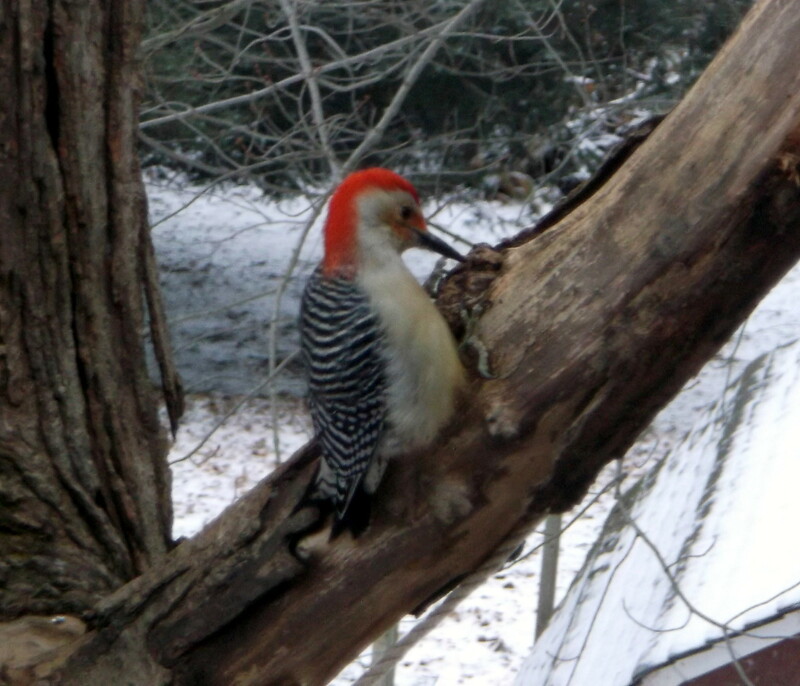 This Red-bellied Woodpecker has just put a sunflower seed into the hole at his feet. Now he is pecking it apart in order to eat it. 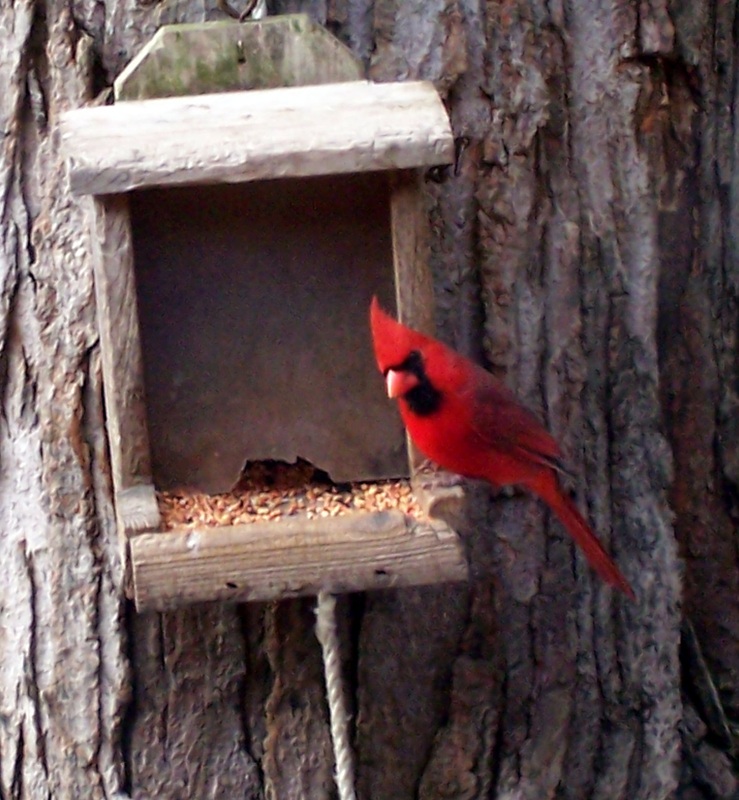 Since he started doing this, and, no doubt, widened the hole; many other birds now use this hole for hulling sunflower seeds! 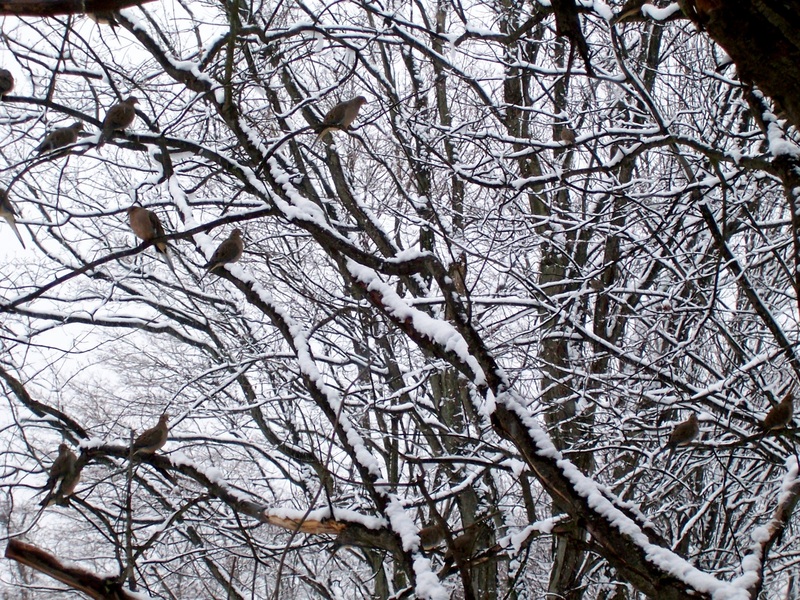 The Mourning Doves all huddled in the tree on a cold winter morning. Hopefully, I won’t be able to take any more pictures like this for at least another six or seven months! Juncos! 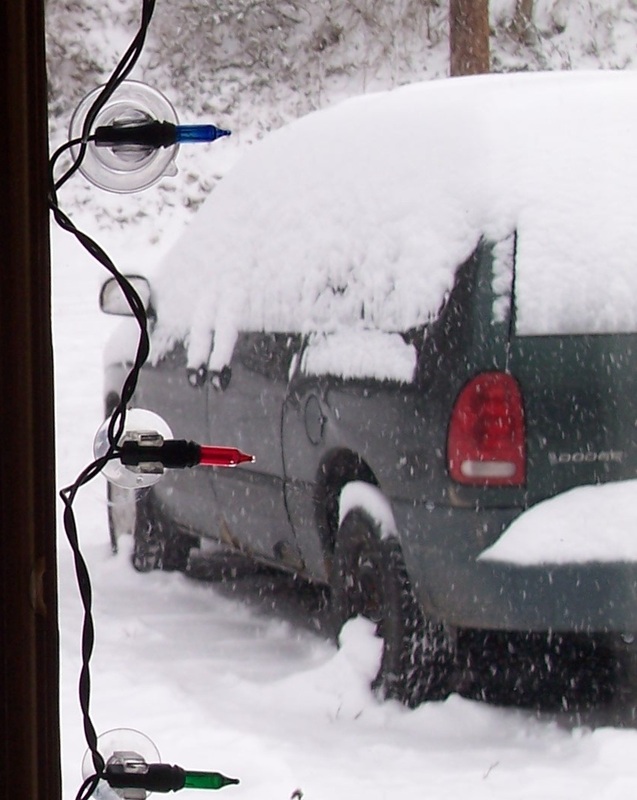 Winter Has Officially Arrived! We have females this year! 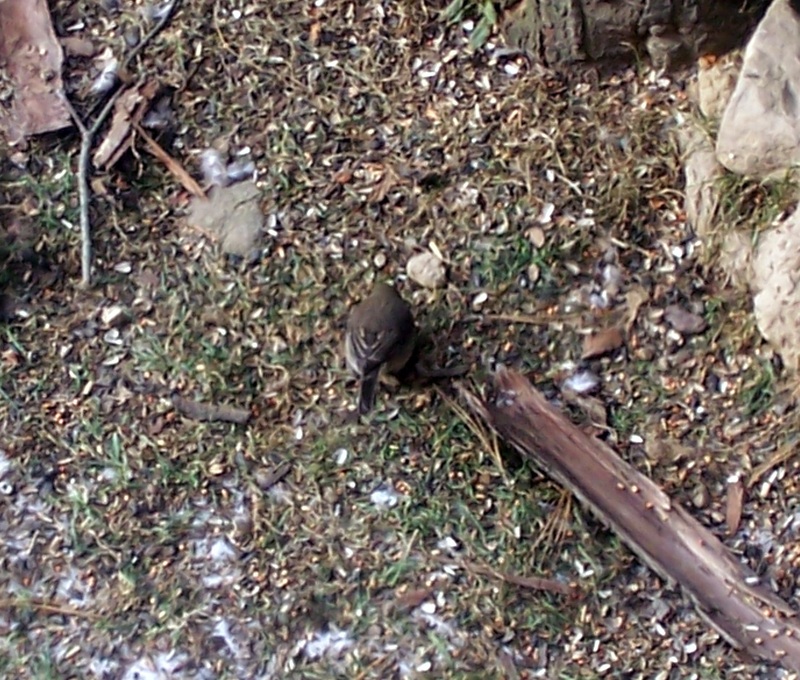 She is brownish while the males are charcoal colored. 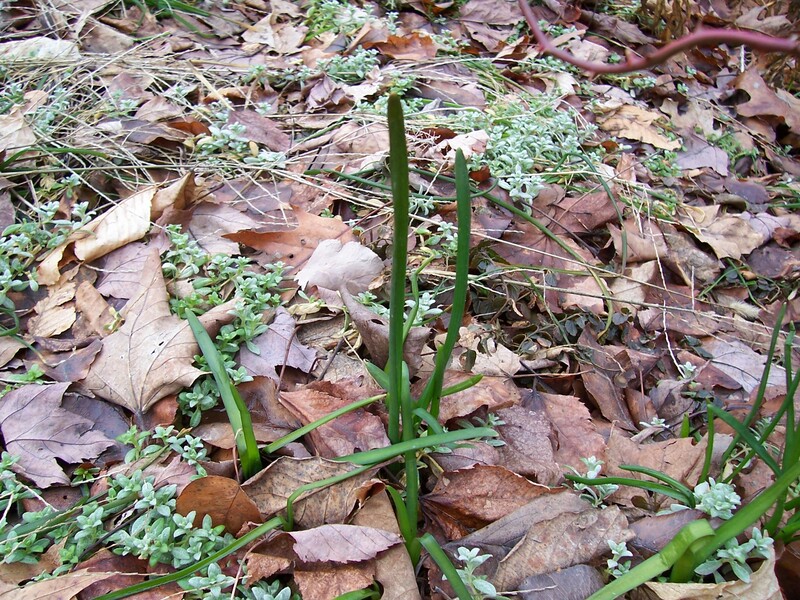 A female (left) and a male (right). 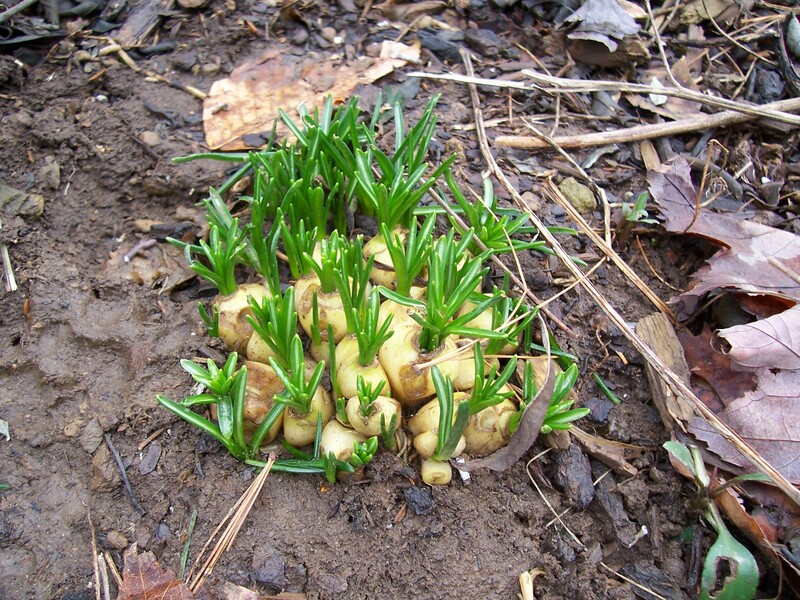 The have a charming way of uncovering seeds and insects. They give the ground a good-looking at with head tilted and then do a double scratch-hop backwards to uncover what they want to eat. A male checking for seeds kicked out of the feeders above in the tree. These birds prefer low shrubs and grasses to trees. Finding one actually up in the tree outside my window was a real treat. 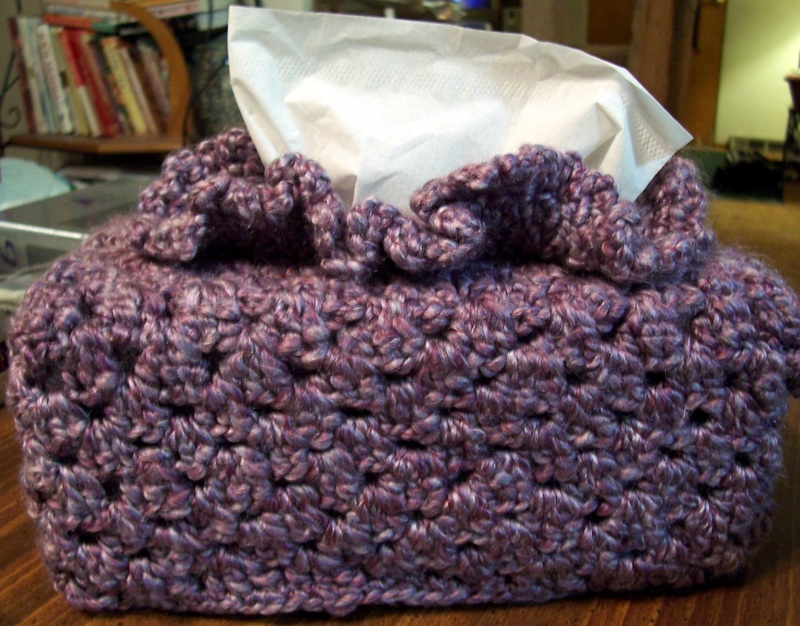 I have made another tissue box cover! This yarn was so soft and fuzzy I couldn’t find the stitches in the start chain. I wound up stitching in toothpick halves with each chain so I could get the pattern started! I killed an unused Halloween pumpkin today. 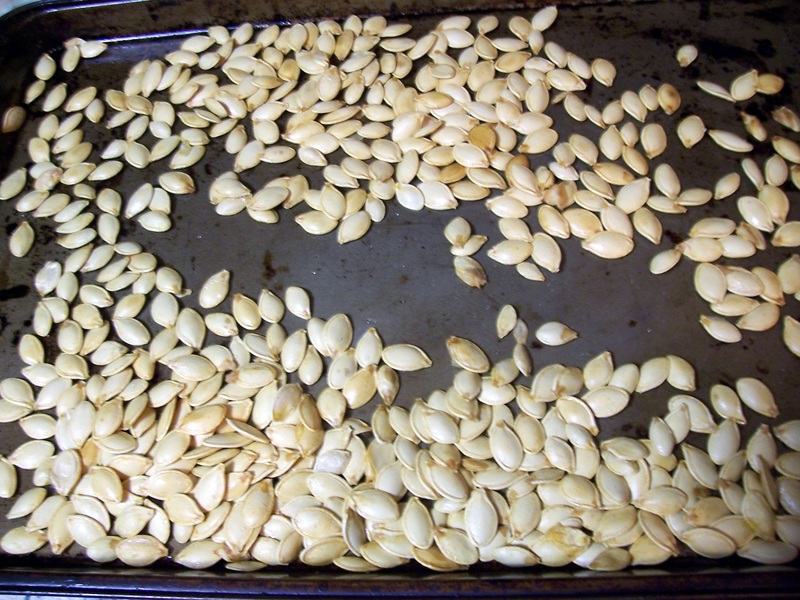 I had to have my annual toasted pumpkin seed fix! 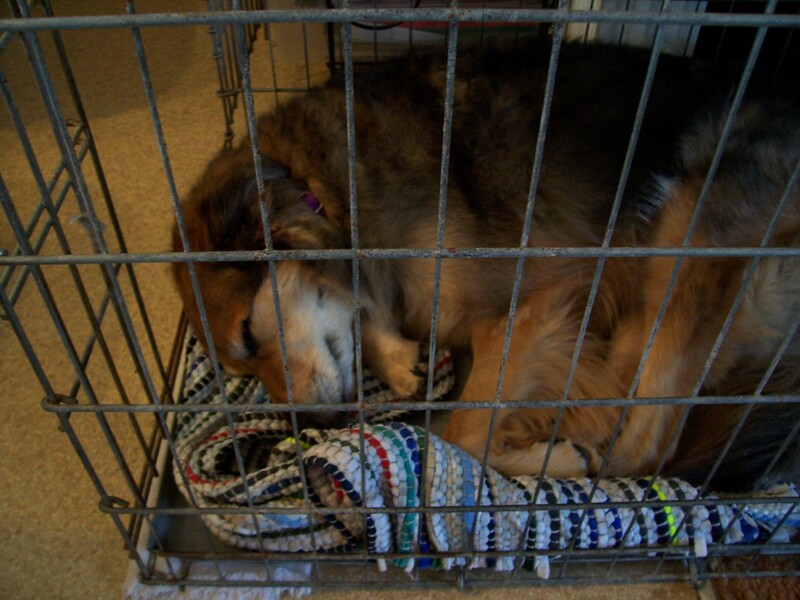 12:13 pm – Night All!